It’s that bittersweet time of year when we bid adieu to poolside lounging, salt air and convivial barbecues, but also sweaty makeup, humidity hair and if you’re not careful, sun damaged skin. Hydroquinone is the chemical used most in skin lightening products to fade dark spots, scars, blemishes and discoloration. Hydroquinone works to decrease the amount of melanin your skin produces, which will in turn make your skin lighter in appearance. But, by lightening with a harsh chemical, the skin becomes more susceptible to the UVA and UVB rays that caused the hyperpigmentation in the first place. It can also lead to dangerous burns or an increased risk to certain types skin cancer. While hydroquinone is effective at lightening the skin, the chemical does pose various health risks long term, the most serious of them being cancer. In some cases, the ingredient has been known to cause cracking of the skin, blisters, and blue or black discoloration. Some additional side effects have been reported as burning or stinging skin, itching, redness and irritation. Due to the health issues that hydroquinone has been known to cause, the chemical is considered illegal and has been banned in several countries. As a harsh medicinal treatment, it has many unknown factors. However, it is still FDA approved and legal in the United States, but medical sources acknowledge its many risks. Interestingly enough, most cosmetic products do not even have to be FDA approved to go to market. According to the U.S Cosmetics Ingredient Review Panel, hydroquinone is unsafe for use in products that are left on the skin – like moisturizers and spot treatment serums. It’s only considered safe in concentrations of less than 1% in hair dyes and nail adhesives, which are the last things we want on our faces. Even at this low concentration in personal care products, it is only considered safe for brief use, as it should be followed by rinsing the ingredient from the skin and hair. Despite various studies, the ingredient is still currently accepted in the U.S in skincare products at a 2% concentration. Overall, the health and beauty industry is largely coming to regard hydroquinone as increasingly unsafe. The Environmental Working Group identified it as a carcinogen, and rated the ingredient as hazardous overall. EWG works to determine the level of safety of ingredients in health and beauty products, and their certification is considered the gold standard in health and wellness. The facts about traditional skin lightening products and hydroquinone are alarming, but there are always alternatives. As warnings about the ingredient are being taken more seriously, natural skincare companies are increasingly providing safer options to targeting hyperpigmentation – hydroquinone free. We’ve created our own alternative: Meet Opalex Lightening Serum, a breakthrough hydroquinone-free skin lightener.It harnesses the power of nature’s antioxidants to naturally brighten dark spots and hyperpigmentation, while illuminating the skin for a radiant complexion. Botanical ingredients, such as Alpha-Arbutin, Azelaic Acid, Mandelic Acid, Licorice Root Extract, Lime Fruit Extract safely block melanin transfer. These ingredients are just as effective as hydroquinone but far less irritating to the skin, and most importantly, it’s non-toxic. Aromatherapy rich extracts add a spa like element to this multi-effective treatment serum. Antioxidant rich, citrus extracts not only brighten skin but also alleviate stress and anxiety. Sage’s antimicrobial properties reduce redness and fine lines while stimulating the mind and relaxing the nervous system. By using anti-inflammatory and antioxidant fruit extracts to counter irritation and redness, this serum is recommended for sun-damaged skin, hyperpigmentation, acne-scars and blemishes. Opalex is rated as a 2 (low hazard) by EWG, which rates products based on ingredients, an important indication to help determine the potential health concerns associated with products. It’s the oldest beauty secret in the book – always wear sun protection! We’ve all read it, we’ve seen it and we know it. If you skip any step in your skincare routine, a daily SPF shouldn’t be it. The idea of wearing sun protection on your skin everyday isn’t always appealing. SPF has the common misconception of being thick, greasy, and leaving a white cast on your skin – but it doesn’t have to. There are plenty of natural SPF products on the market that are designed just for your face, to make sure you can stay protected but still look your best – and yes, even wear makeup over them. Many people see applying an SPF as an extra step in their skincare routine, rather than an essential. Or they think because, “I don’t sunburn,” that it’s not necessary for them. While we all love the sun, there actually is a lot of damage that the sun can do to your skin if you don’t stay protected. Aside from sunburn, sun exposure ages your skin, creates fine lines, dark spots, hyperpigmentation and skin cancer. All of these effects are harmful, but dark spots and hyperpigmentation are often the first to be noticed and addressed. Spot treatments are a cosmetic fix, but many people go straight to the doctor’s office when they notice hyperpigmentation, and they often opt for expensive, abrasive in office treatments like lasers or at-home products to lighten the skin, that may contain unsafe chemicals. The most notable of these chemicals is Hydroquinone. Enter the season of strolls in the park, autumn leaves and Pumpkin Spice Lattes — or Turmeric Lattes, as the tide seems to be turning. What do these telling signs mean? It’s time to transition from your summer to fall skincare routine. We’re all about double cleansing. And, if fall gives you a friendly nudge to experiment with a bolder lip color or golden contour, that extra cleanser is a must for removing makeup. Hydrating Cleanser is great for removing makeup on the first round. Cleanse again to deep clean — you could incorporate a relaxing and (we think) essential Lymphatic Massage. Renew the skin cells with a natural gentle exfoliant. Glow To Go Glycolic Acid Peel Pads are a facial in a pad. These convenient AHA pads brighten skin and fix a whole slew of concerns from acne to fine lines and wrinkles. 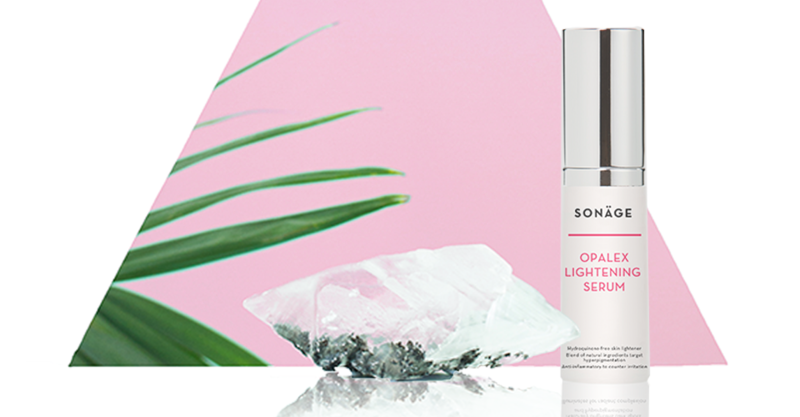 Apply Opalex Lightening Serum once or twice daily for a brighter, more vibrant complexion. Then quench your skin’s thirst with a richer moisturizer than your lighter summer go-to. For your morning routine, always finish by patting on a natural SPF to protect your skin, a step that is especially essential after exfoliation. We recommend SPF 15 and higher. Protecting your skin is the only way to prevent aging and harmful effects from the sun.